Martha's Favorites: IT'S BEGINNING TO LOOK A LOT LIKE CHRISTMAS! Hello Ladies! Welcome to Tea Cup Tuesday No. 250! Are you tired yet? Life just got put on speed for everyone. I love December, but I must admit, I get tired so easy. I have a big tea party here at my home on Wednesday night. It is a annual party I host for the ladies of our church. It seems each year our home gets smaller and smaller, but I love doing it. I can officially say, I am done decorating for Christmas. Most people take a couple of days, I can take a couple of weeks easy. I am going to share my mantle this week. I don't know, why I love to decorate so much, but I do. I should have done that for a living. I make such a mess while decorating, my home can look like it was robbed, that I am sure would be a problem. Everyone I see decorating will take out their boxes and look so together doing it. Not me, I make a mess, change my mind and move everything around, all over again until I get it right. Is anyone else messy when decorating? Here is the first tea cup I am sharing this week. It is a a Royal Stafford. Love the rich gold colors on this cup. My next cup is a Royal Grafton. It is the same style as the first cup, very elegant. My last cup is Depression Glass, Ruby Glass. I have the entire dinner set, service for 12. It is perfect for Christmas. Saw all my Grandchildren this weekend. It always makes me so happy. Sophia was here all weekend. Today I am missing all three! Please take time to rest this week. Terri was going to try and join us, we will see. Keep your fingers crossed. I would appreciate your continued prayers for my son. He is improving very slowing, but each day seems better than the next for him. Sending hugs your way! I did it! I posted! Yay! Thank you so much for doing such a beautiful job keeping Tea Cup Tuesday every week! I hope I can join in again soon. Your tea cups are stunning! I have a soup bowl match to your first tea cup, actually four of them. Your grandchildren are a font of joy! Oh yes, Martha, I make such a mess while decorating, too. I'm always tweaking things, too, to get them just right. It must be an obsession! Your home looks so festive and I love the teacups you've shared. Your grandchildren are adorable and I know bring you much joy. I'm still praying for your son. Everything is beautiful at your house! Decorating for C'mas never ends, as if you're like me, I'm always changing around and yes, I make way too much a mess I have to clean after! C'mas is G'children's season...so cute! Thank you for the lovely tea party. Love your tea cups, Martha. Grandchildren are a blessing,enjoy every moment you can with them, they grow up so fast. What pretty teacups, Martha! I think a lot of us make a mess when we begin decorating. It used to take me weeks. Glad your son is feeling a little better. Have a lovey week and Merry Christmas! Everything really is looking like Christmas at your house! So beautifully decorated. Love all three of your tea cups choices for your tea today. Family is precious; prayers for your son. Hi Martha. I love your Christmas decorated home! Wonderful! And the teacups are gorgeous! 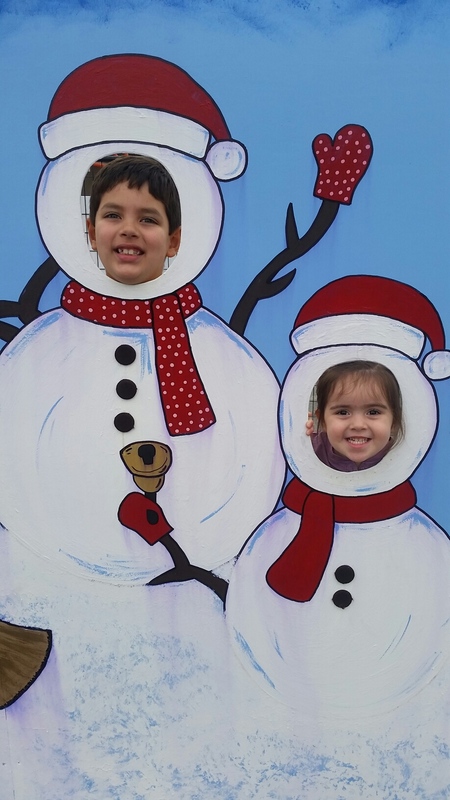 The snowman photo with the kids is so cute! Thanks for hosting and nice to have Terri back too! Have a great week! Thanks for hosting Martha! I hope you and your family have a wonderful Holiday season! Oh, trust me Martha. When I start decorating, the whole house looks like somebody turned it upsidedown on its roof. I'm just about done now and I'm grateful. But STILL haven't finished getting all the gifts needed. Oh well. There's still time. Glad Kyle is better. Prayers continue. What perfect cups for Christmastime! Love the fresh look of your blog. The white makes your photos pop. Fabulous! Everything is so pretty and yes I make a huge mess whether I'm decorating the house I live in or the miniature houses! Maybe it's just artistic temperament?? Any ways that's my story and I'm sticking to it, Hee Hee. Thank you so much for joining my blog recently, I truly appreciate it. Your mantle looks FUN! And that's what counts! I am TOTALLY messy when I am deciding how things should go - don't you go feeling bad! Your first red and gold tea cup made me gasp, it's that stunning - WOW! Hope to see Terri come back, I don't know what's wrong but sure hope she and her son are ok? Sounds REALLY scary and serious? I continue to pray for them and for your son, and also you, Martha. Thank you for hosting. Hugs. Your teacups are lovely & your home looks so festive & pretty! If it makes you feel any better, I am a messy decorator too. The whole house is in chaos for days when I decorate! Thanks Martha for hosting! Love your mantel, so many pretties! Your teacups are all beautiful and perfect for Christmas! Martha, your posts make me smile :) I think we all feel that things are a mess before we are done decorating. I still have my mantel to do! Yours looks beautiful. Sounds like you are busy with your tea and with the grands. Happy times! Your son remains on my prayer list. Glad to hear he is feeling a little better. Hi Martha, how lucky your church ladies are to have the opportunity for a December tea at your home. I am sure the decorating mess was gone when they arrived. I'm loving join the teacup.